For over 100 years, Wrigley Field has provided fans with priceless memories, storied milestones, and iconic moments. 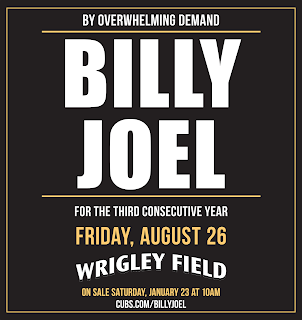 The Chicago Cubs and Live Nation Chicago are proud to announce that by overwhelming demand, Legendary Musician Billy Joel will return to Chicago to perform at Wrigley Field on Friday, August 26, 2016 to deepen the legend of the ivy drenched walls. 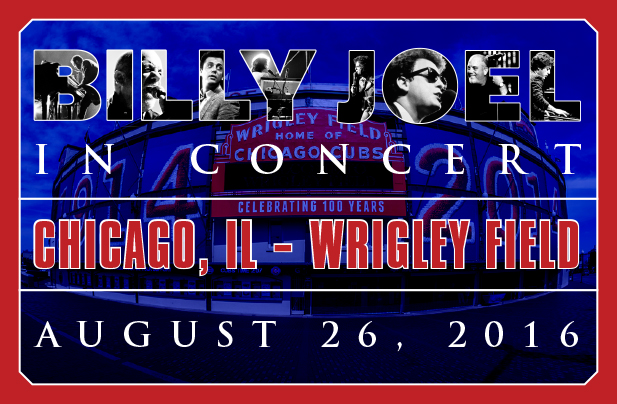 This performance will make Billy Joel the first artist in history to play Wrigley Field for three consecutive years, and a record-setting fifth overall appearance. 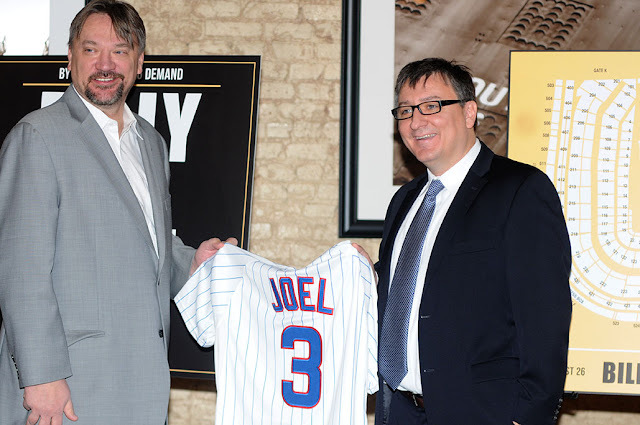 Billy Joel is undeniably the all-time leader in concert ticket sales for the storied ballpark. 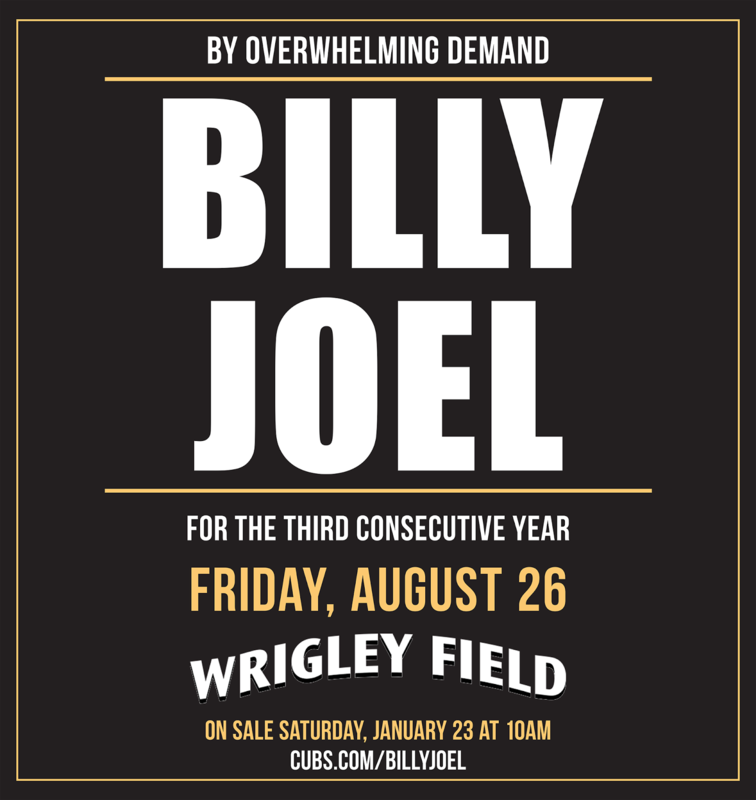 Tickets for the general public go on sale Saturday, January 23 at 10a via Cubs.com/BillyJoel. American Express® Card Members can purchase tickets before the general public beginning TUESDAY, JANUARY 19 at 10:00 AM through FRIDAY, JANUARY 22 at 10:00 PM. 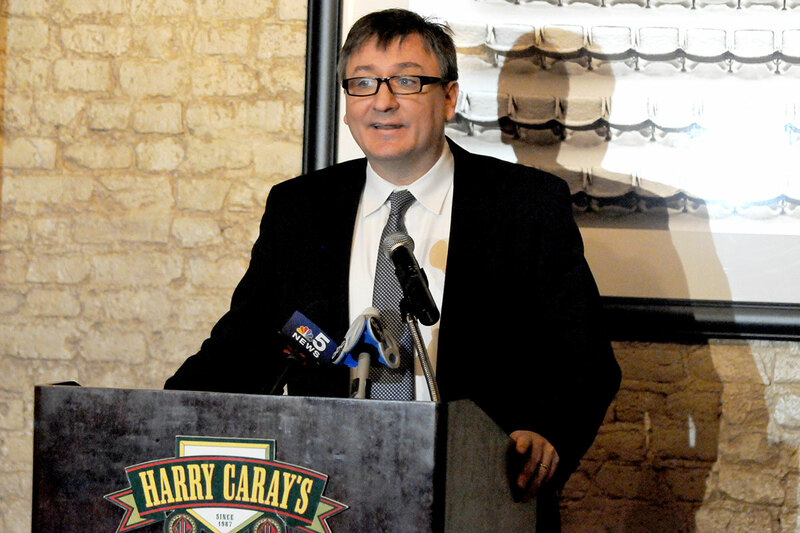 Tickets will be available for purchase by the general public beginning 10 AM on SATURDAY, JANUARY 23 via Cubs.com/BillyJoel or by calling 1-800-THE-CUBS. 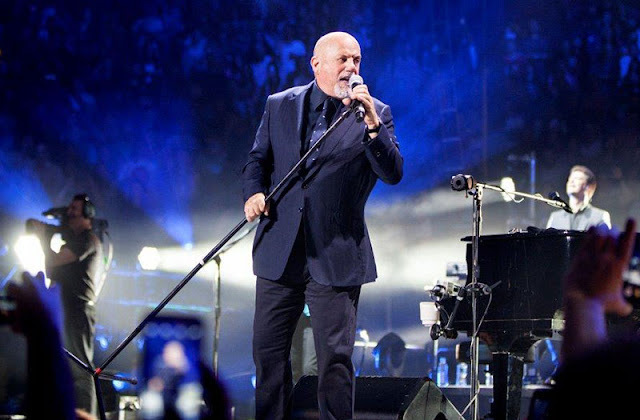 In December 2013, Billy Joel became Madison Square Garden’s first-ever music franchise, joining the ranks of the storied venue’s other original franchises – the New York Knicks, Rangers and Liberty. Since January 2014, Joel has played one show per month at The Garden as part of the Time Warner Cable Concert Series. This unprecedented and wildly successful residency has led to 30 sold-out shows through June 2016. Having sold 150 million records over the past quarter century, Billy Joel ranks as one of most popular recording artists and respected entertainers in history. The singer/songwriter/composer is the sixth best-selling recording artist of all time, the third best-selling solo artist and is one of the highest grossing touring artists in the world. Joel is also one of the biggest live performing artists in the world and his concerts continue to break records in both arenas and baseball stadiums. In December 2013, Joel received The Kennedy Center Honors, one of the United States' top cultural awards. He is also the recipient of six GRAMMY® Awards, including the prestigious Grammy Legend Award. Joel has been inducted into the Songwriter’s Hall of Fame and the Rock and Roll Hall of Fame and has received numerous industry awards including a TONY AWARD for "Movin' Out," a Broadway musical based on Joel’s music For his accomplishments as a musician and as a humanitarian, Joel was honored as the 2002 MusiCares Person Of The Year by the MusiCares Foundation and the National Academy of Recording Arts & Sciences. Live Nation Entertainment is the world’s leading live entertainment and ecommerce company, comprised of four market leaders: Ticketmaster.com, Live Nation Concerts, Artist Nation and Live Nation Network. Ticketmaster.com is the global event ticketing leader and one of the world’s top five ecommerce sites, with a database of over 119 million fans who visit our sites. Live Nation Concerts produces 22,000 shows annually for more than 2,300 artists globally. Artist Nation is the world’s top artist management company, representing over 200 artists. These businesses power Live Nation Network, the leading provider of entertainment marketing solutions, enabling nearly 800 advertisers to tap into the 250 million consumers Live Nation delivers annually through its live event and digital platforms. For additional information, visit www.livenation.com/investors.